This is a brief amateur history of La Rochebeaucourt and Argentine and is not intended to be used for study purposes. I am no historian, and will appreciate any correction, remark or comment with the greatest pleasure. View of the river Nizonne from the bridge at La Rochebeaucourt and Argentine. To the left the Charente, to the right the Dordogne. A Brief History of La Rochebeaucourt and Argentine. Rubeboviscurti – The name translates as a place on bedrock where cattle are raised on a farm or domain. This ancient settlement was ideally situated in a land with a temperate climate, an abundant source of water, an immense forest home to an unlimited supply of game and providing mushrooms, chestnuts as a food source and acorns as pig feed as well as ferns for animal bedding. The forest provided wood to build dwellings and tools for agriculture as well as firewood.There is evidence of defences made of a levee of earth lined with ditches of water fed by the river Nizonne. Remains of the foundations of a thick wall and historical records referring to La Rochebeaucourt as a walled town indicates that when the Romans arrived here they built walls to enclose the village and protect the church. In the archives of the church at Angouleme of 863.a visit by the Scottish bishop of Angouleme (Helie), to the church at La Roche’ is mentioned so there appears to have been a church there from about the 9th century. In 1215 it is rebuilt on the model of the abbey of Cluny. Popular latin became the language of the day and Rupeboviscurti became La Rocheboeufcourt. The village by the 13th century is important enough to become part of the province of Perigord; one of 32 walled settlements in the region. 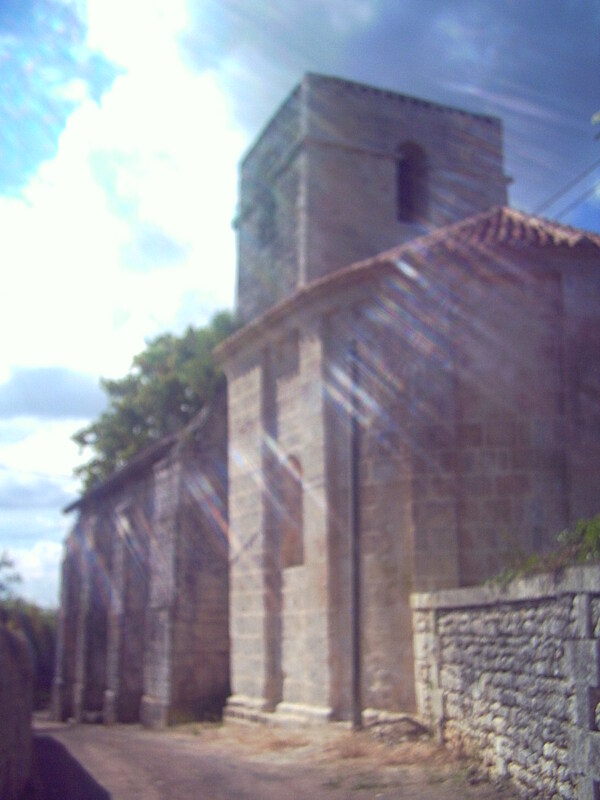 After the 100yrs war the village is left destroyed and the church abandoned. But not for long! Jean III who in 1495 became Lord of La Roche initiated a programme of repopulation, reconstruction and development in La Rocheboeufcourt. 1515 – 4 fairs are established in the village by Francois I – 25 Jan., 6 Aug., 22 Oct.and the day of St Pauls conversion. At the beginning of the 16thC the protestant reformation church was established in Perigord. The grandson of Jean III became Calvinist and started a temple in La Roche’. I have reproduced a letter by Lady Jane Fairbourn who writes about her travels in 1560 and mentions the danger of being attacked on the road by Calvinists. ………….From the Chateau de Mareuil to the Chateau de la Rochebeaucourt is but two leagues, but even in 1560 the journey can be fraught with danger, from the very marshy character of the river valleys and from attacks by Calvinists. The Chateau de Mareuil is the seat of one of the four Baronies of the Perigord and therefore often frequented by great nobility and by royalty. The Chateau de la Rochebeaucourt was one of the strongholds beloved of Francois Premier, who was born in the region, one of the Four Rocks on whom he depended for his defence of the area. From Mareuil, one follows the River Belle, on its South West bank, along a broad and pleasant valley, between wooded hills. In Summer it is delightful, but in Winter the whole valley can be flooded. Then it is necessary to travel on horseback, keeping to the very edge of the flood water. The ladies should be borne on litters. Half a league from Mareuil, great care should be taken. There is a road leading off on the left, through dense woodland, known as the Chemin des Assassins, because merchants are frequently attacked there on their way to or from the market of Mareuil. There is a market at Mareuil once a week and a Fair once a month. 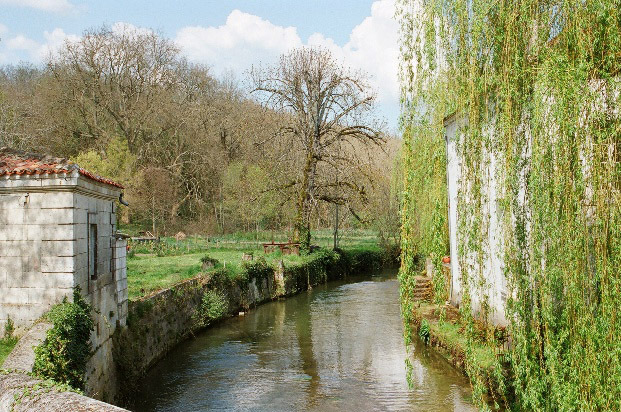 Just after the Chateau d’Ambrelle, perched on its hill to your right, the little river Belle joins the much larger river Nizonne, whose valley you follow to La Rochebeaucourt. Again, the river valley is frequently flooded in Winter and also in the Spring, when the snows of the Auvergne melt and are brought down to the Dordogne. At La Rochebeaucourt, you will see the Castle on your right. You must cross over the bridge, as the village of La Rochebeaucourt is on the left bank of the Nizonne, but the Castle is on the right. 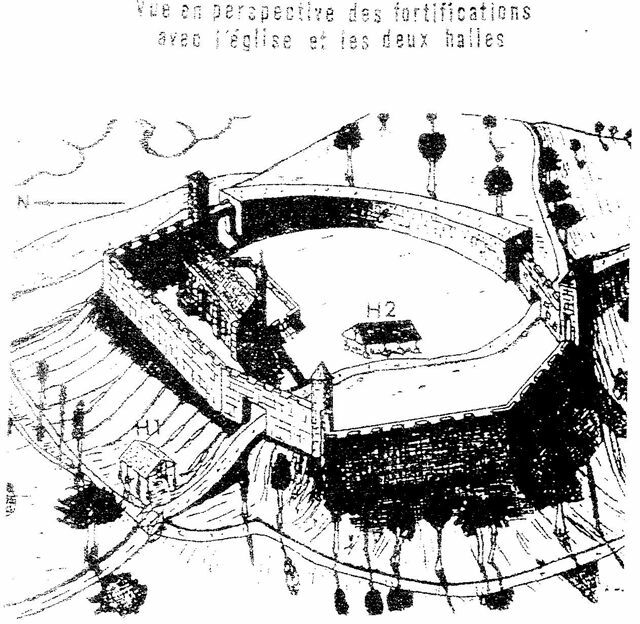 If the flooding is very bad, you can follow the hill route, passing close to Sante Croix de Mareuil and coming into La Rochebeaucourt from the South……………..
During the 17thC the first market place was demolished as it spoilt the view from the chateau! The one remaining was enlarged. By the end of the 17th century La Roche’ was still enclosed within the confines of the ancient walled fortifications. But at the start of the 18th C we see the village start to expand beyond these limits. At the request of Louis Alexandre de Galad de Bearn the king Louis IV established three more fairs. 14th Sept (Fete de St Croix), 21 Nov. and 31 Dec.
With these new fairs La Roche’ expanded its popularity and went from 50 dwellings to 80 dwellings in just 30 years. About 350 inhabitants. To prosper further it needed to expand outside of its original boundaries. 1730 – the fortifications are still intact and the streets are describe as dirty, litter strewn and the water unclean and its inhabitants as ‘gross’! But La Rochebeaucourt prospered. At the death of Louis XV La Roche’ was still only 12 hectares but its centre was a hive of activity. Full of small businesses and artisans. Potter, knife maker, leather worker, locksmith, cobbler, mechanic, stonemason, timber merchant and carpenter. And you could find the services of a doctor or surgeon, solicitor and lawyer. There are still 2 buildings in the village with the auberge name but sadly they are no longer serving drinks.’ The Bonne Auberge’ and The Boule D’Or ‘both on the Angouleme – Perigueux road. 1790 – Winds of change after The Revolution. No historical documents have been found pertaining to life at Argentine. So many questions left unanswered. Its history is pure speculation. Head out of La Rochebeaucourt on the Riberac road and you will notice the landscape to your left changes to cliffs, escarpment and caves. Argentine is situated 2km from La Rochebeaucourt above the cliffs on the limestone escarpment (plateau Argentine),which is now a protected site in the Perigord and Limousin Nature Park. From April to June rare orchids flower across the rocky terrrain. There are remains of an old roman road. From Perigueux to Saintes and the old railway track cuts through the limestone rock on its way from Angouleme to Mussidan. It makes a lovely walk on a hot summers day. It becomes the GR 36 (a designated, signposted walking track), at the Pont de Boudoire.. There are only three or four houses left of the village Argentine. At one time the population was two and a half times greater than that of La Rochbeaucourt, the terrain was many times larger extending 1700 hectares over the plateau of rock plants and juniper trees and the village richer than La Roche’ so why was it abandoned. It is a mystery. 1827 saw the merger of La Rochebeaucourt and Argentine into one commune as it is today. It happened very much against the wishes of the inhabitants of Argentine. Could this have triggered the sudden decline? The ancient church a mixture of 11thC, 12thC, and 14thC still exists today and is being renovated this year after a century and a half or more of neglect. There is the ruin remains of a castle once owned by the family Galard de Bearn. Just a tower, a few walls and a well left of what at one time must have been an impressive building. 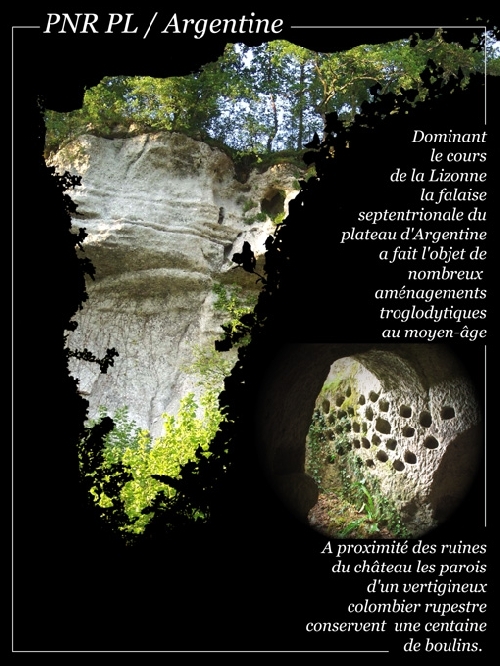 3 main caves exist – Le Grotte des Anglais, Grotte des Tombeaux and Grotte de l’Eglise. Which in periods of war were used by the locals to hide out and the English during the hundred years war. They were also said to have been used by the ‘maquis’ in the second world war. 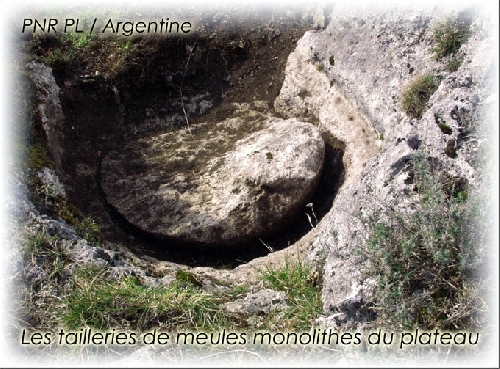 Between Argentine and Baix there is a dolmen and other megalithic stones. There are also caves left from the time it was quarried. You can see the traces of the blocks that were cut out of the rock. Later the caves were used for growing mushrooms. There is also speculation that Argentine was originally a country house for the Knights Templar in the 13th century. I am currently working on Part 2 from The Revolution to the Present Day. Apologies for it taking so long. I just don’t seem to find the time. 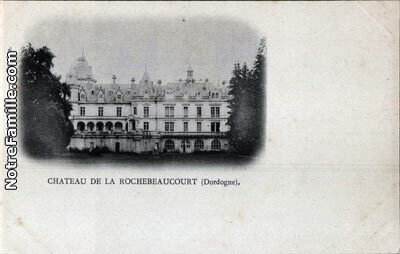 Click on La Rochebeaucourt 1910 to see ancient postcards of the village and Mareuil sur Belle. Very interesting! 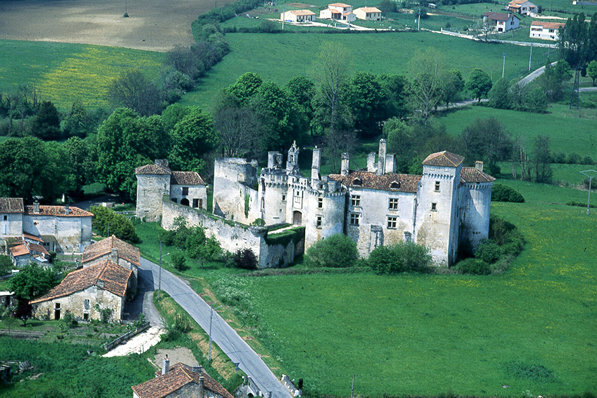 We often pass thru Roch’ to Angouleme and its tragic to see the marvellous chateau in such a bad state. Is there any further reading on this you could recommend?The life of the family who owned and lost it perhaps? Thank you. You may be able to learn more about the chateau etc from the local La Roche’ website. 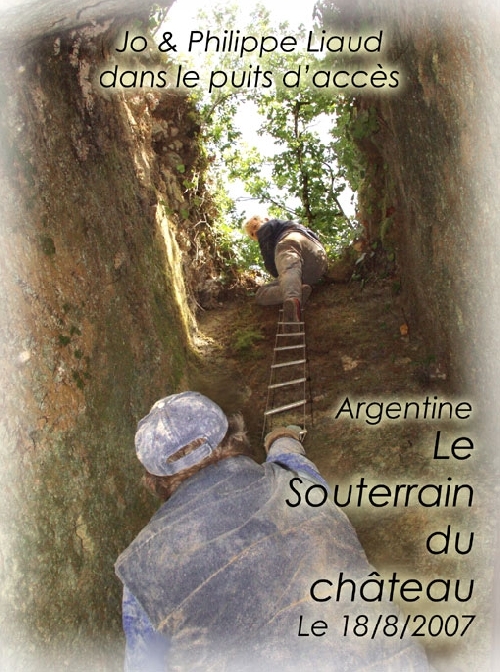 Just to let you know as of July this year the two caves ‘cluzeaux’ at Argentine, (La Rochebeaucourt), are open and are easily accessible to the public. There is more information available on the La Rochebeaucourt website.